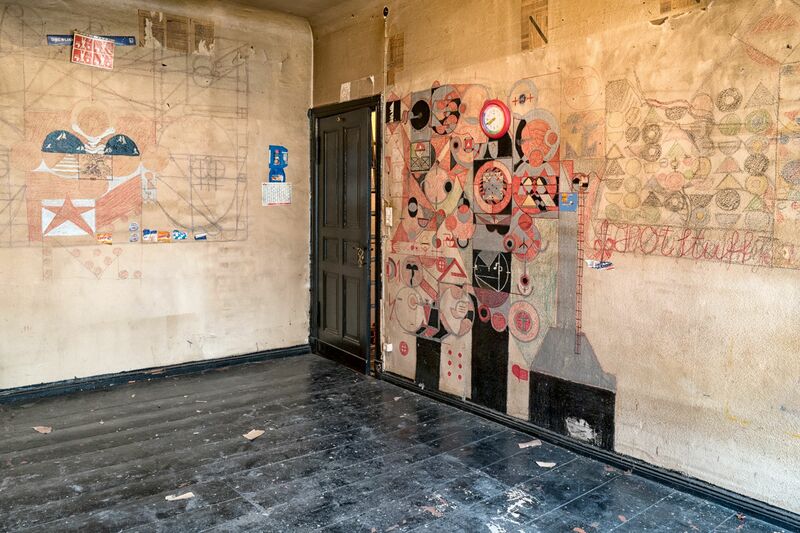 Wall drawing in van Bender's Berlin apartment. Courtesy Delmes & Zander, Cologne. 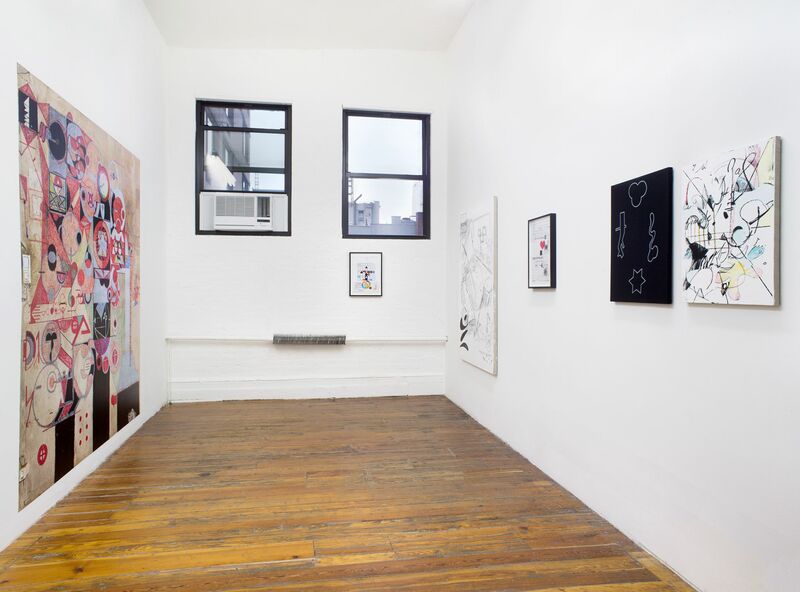 PAGE (NYC) presents a two-person exhibition by Sofia Leiby (US, b. 1989) and Adelhyd van Bender (Germany, 1950–2014). 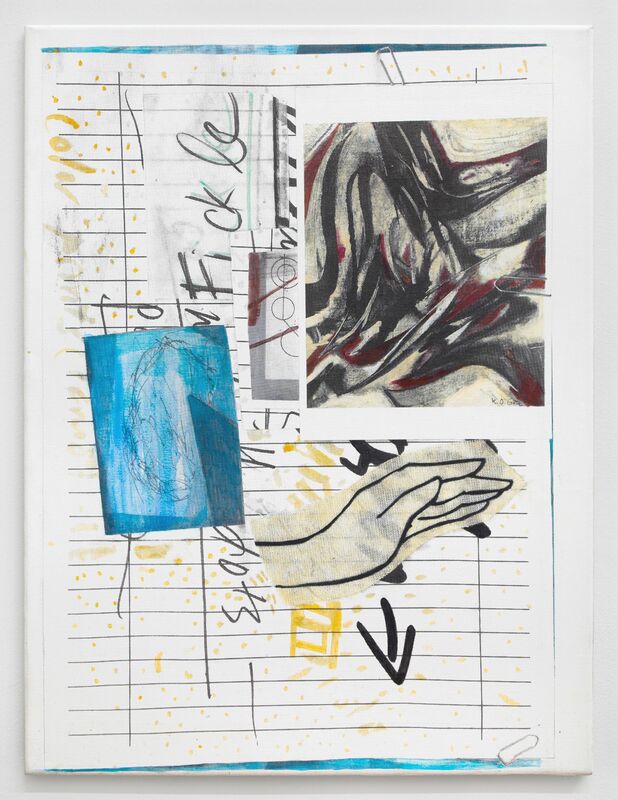 New readings of van Bender’s drawings are made possible in connection to Leiby’s work; her new paintings are inspired by research into the pursuit of aesthetic exactness, “success” and balance within mid-late twentieth-century German theories of perception and Gestalt. 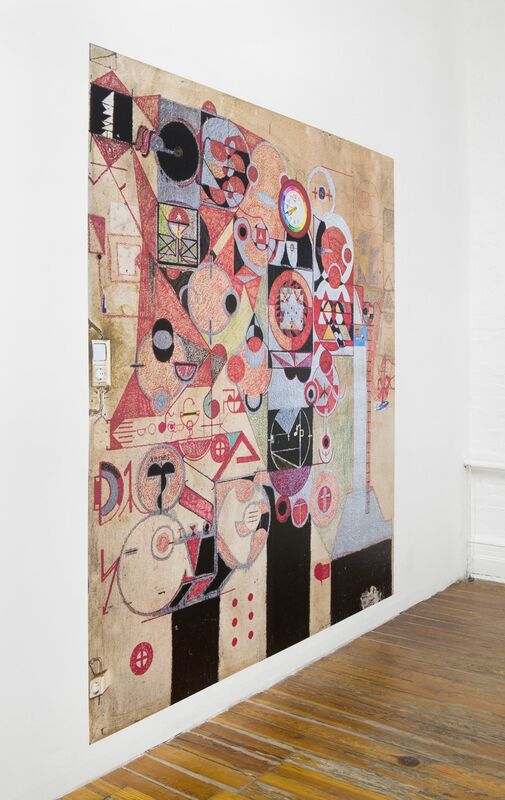 One section of a wall drawing from van Bender’s Berlin apartment is reproduced in the gallery for the first time. 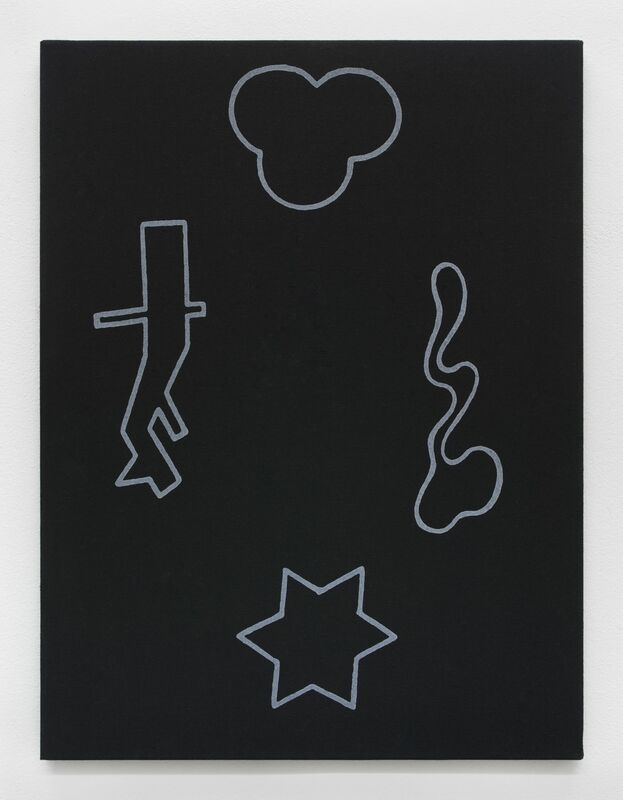 When Sofia gave me the title of her silkscreen painting as PRÄGNANZ / Götz, Arnheim, Maitland-Graves (2017), she explained that “‘Prägnanz’ is a strange German word that basically means, ‘aesthetically successful and concise,’ and dates to the time period relevant to the tests.” The tests are those devised in the 1970s by K. O. Götz (1914–2017) as an improvement on the discredited Maitland-Graves Design Judgement Test of thirty years prior. Tired of art criticism’s “idealistic” “word cascades,” Götz studied Gestalt and other fields of psychology and information theory in the interest of establishing an “exact aesthetics”—a new way to “objectively” measure visual abilities and evaluate expressive form. Participants in the resulting visual aesthetic sensitivity test (VAST) were asked to work their way through a book of fifty-two pairs of black abstract shapes that Götz had drafted and report, casting subjective preference aside, which of the two was more balanced. Although Götz asserted that his scientific and artistic interests were separate, in Leiby and van Bender’s work these parallel pursuits collide, and are brought into relation with features of lived experience that Götz had wanted to discount. The influence of advertising, for example, presented an unwelcome distraction to Götz, apparently limiting “a broader visuo-aesthetic judgment” in his test subjects. But when Leiby points to the reproduction of a VAST drawing in the lower left hand corner of her PRÄGNANZ, I find it resembles the graphic used by Newport cigarettes—a dynamic arc synonymous with the brand’s slogan “pleasure!” Götz’s test subjects would have been further disadvantaged if they let pleasure affect their judgement; they were issued an instruction: “Note that you are not asked to say which design you find more pleasant. Your task is to discover which of the designs is the more harmonious one.” Out of step with the dominant artistic tendencies of the 1960s and 70s—pop art on the one hand, and engagement with post-structuralist critical theory on the other, Götz seemed to want to place form under scrutiny in an artificial vacuum. How to separate balance, harmony and pleasure? And how to engage with balance in a non-normative way? Götz conducted further research with the psychologist H. J. Eysenck, author of the Eysenck Personality Inventory (EPI) used to measure Extraversion-Introversion, Neuroticism-Stability, and assertiveness. “Do personality traits have an influence on the choice and preference of color and form?” This was the question that Götz and H. J. Eysenck collaboratively sought to answer with Rissa, the German painter who married Götz in 1965. When the results of the VAST and the EPI were compared it was found that the most assertive individuals tended to prefer unbalanced less harmonious forms. But the tests were unpopular, never taken in a large enough sample size to provide valid results. As Rissa recalls, “the 1970s were not a good time for empirical research in Germany. The 1968 movement was in full swing and people often refused to complete the questionnaire. Some people claimed that I worked for the exploitative capitalistic system by administering tests and they did not want to get involved in such a project.” These were the times of Adelhyd van Bender, who moved within Germany in 1968 from Ludwigshafen to Berlin, where he mixed art and science in his work non-prescriptively. 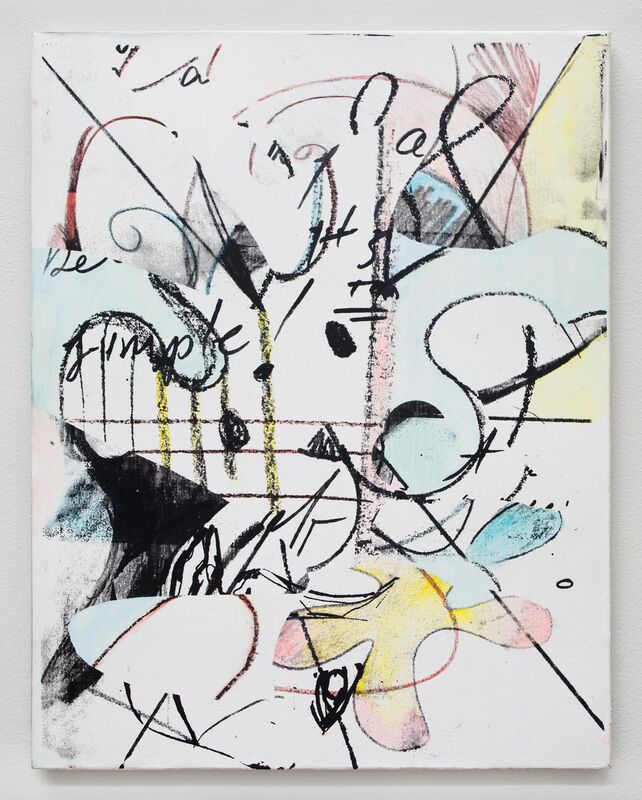 As much as harmony in composition, balance in van Bender’s work appears as a refusal to choose either or. Repeatedly referring in notes and drawings to “Geschlecht” (gender), van Bender “seems to have identified as both male and female,” and strikes a balance in self-portraits as lady justice with scales. 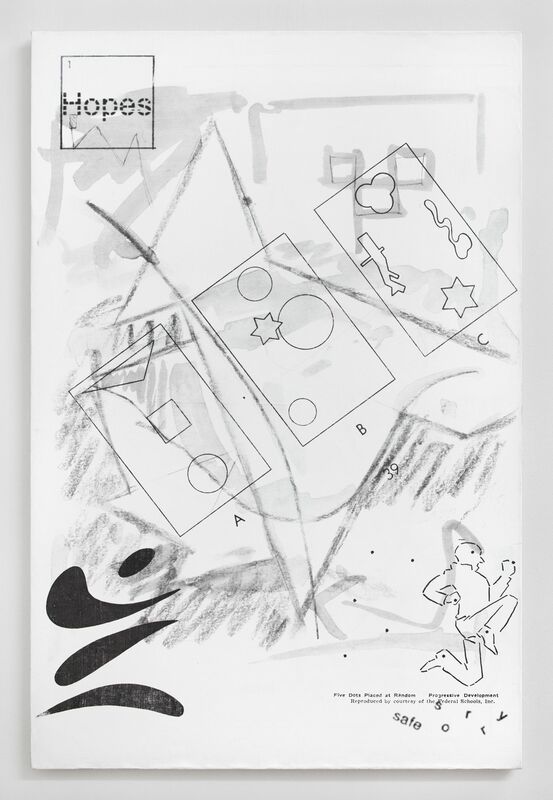 Further systems of categorisation and judgement appear to have been refused: a van Bender drawing in this exhibition suggests a system made up of false choices: “D. Tradition. D. D. Fashion. D. D. Opinion. D. D. Neurer [innovator]. D.” Is this an allusion to the art critic’s terms of recognition? 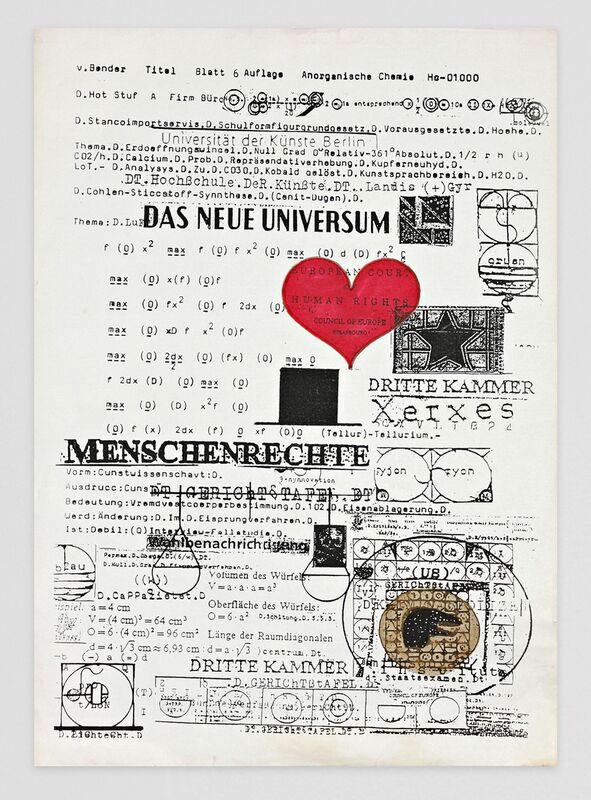 Further works on paper carry the stamp of Universität der Künste Berlin (Berlin Arts Academy), the school that forced van Bender to exmatriculate in 1976. Reasons for exmatriculation from UdK today include failure to pay your fees or failure of the final examination. Poor performance or poor circumstance, or an interrelation of the two. In addition to a history of mental health issues and unemployment, it is likely that van Bender would have rejected his school’s terms of success. 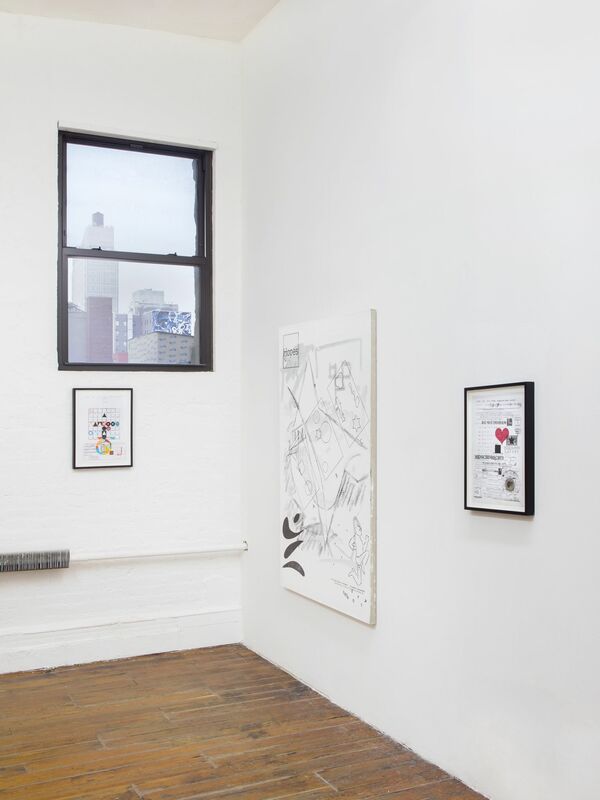 He was prolific in his own hermetic way, working steadily on paper and on the interior walls of the apartment he inhabited from 1970–2014. 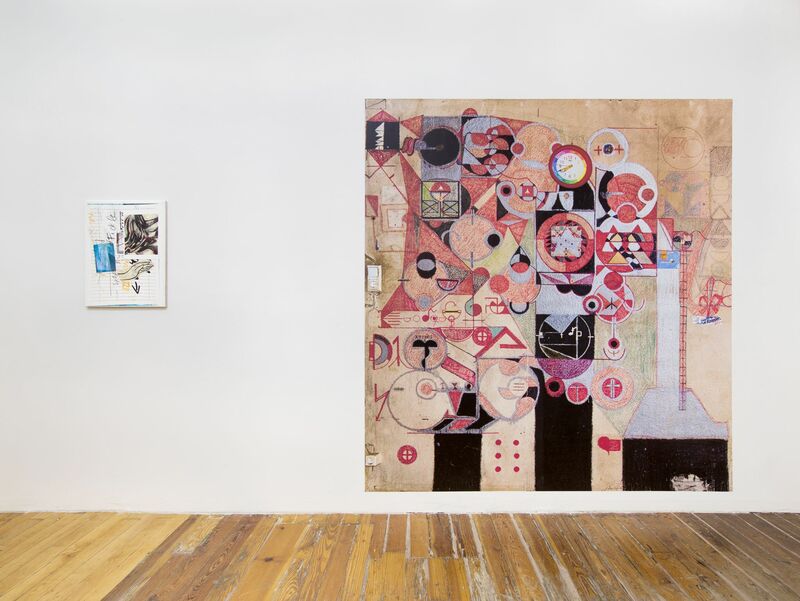 An apartment wall drawing, whose preservation was refused by van Bender’s landlord upon the artist’s death, is reproduced in this exhibition. It features a clock, its hands stopped at twenty to eight. 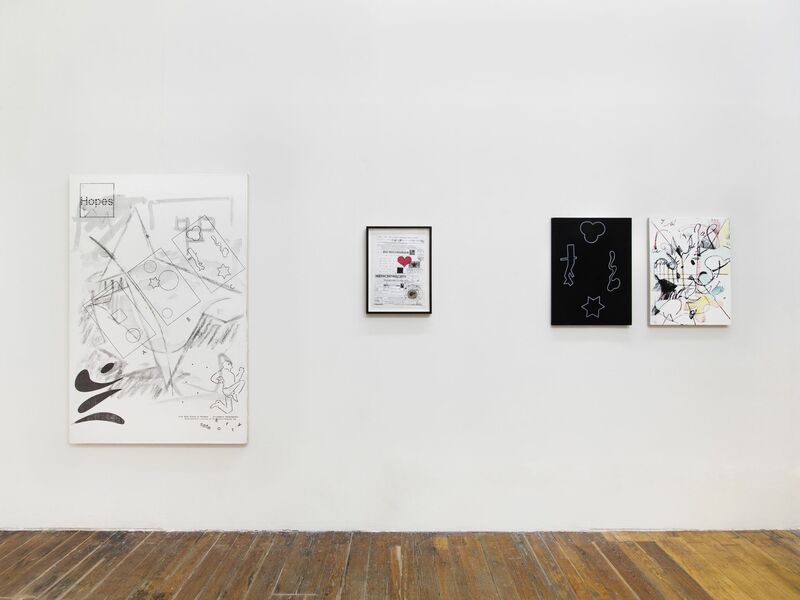 What does it mean to translate van Bender’s work from a place of non-exposure in pre- and post-unified Berlin to a site of display in present day New York? I am thinking of ideas of artistic success across time. 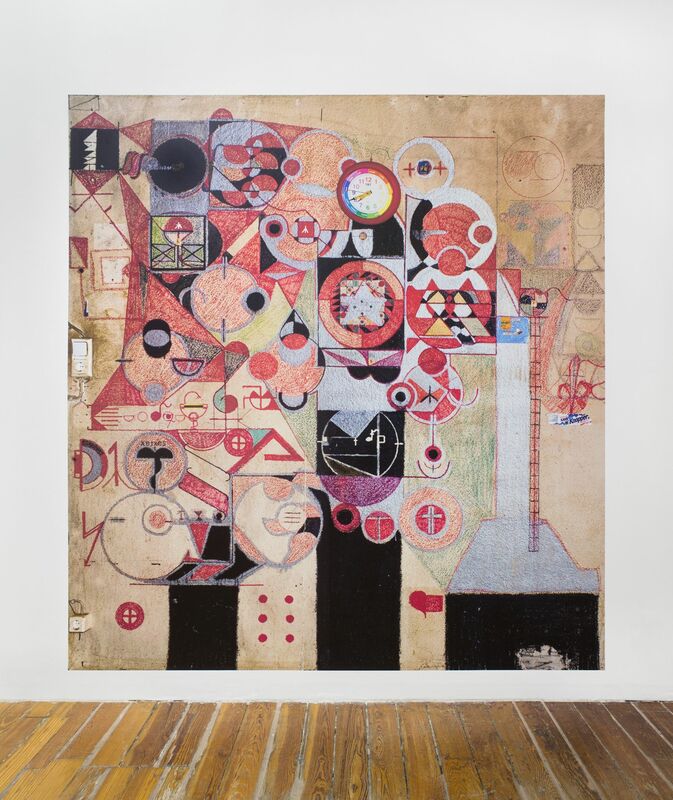 If Götz’s contemporary Rudolf Arnheim “aimed at theory that actively participates in the way artists do their job,” his primary concern, in accordance with Gestalt psychology, was to restore the importance of the sensory processes to our understanding of art. He argued in “Gestalt and Art” that vision, hearing and touch ought not to be cast in a subordinate role to the mind: “through his eyes and ears, the artist directly grasps the full meaning of nature’s creations, and, by organizing sensory facts according to the laws of ‘prägnanz’, unity, segregation, and balance, he reveals harmony and order, or stigmatizes discord and disorder.” What if Gestalt theory were revisited today as part of a holistic practice of sense making—of the visual and aural stimuli we encounter in the world, across art and advertising, through digital media, as we move between people and screens, between artists and non-artists and artworks striving for distinction from other images? Art might be introduced via Gestalt to a different kind of time, or art reconsidered via the principles of Gestalt might introduce a different pace to time ordered digitally. It sometimes sounds like art according to Arnheim is a game to be won: “To rise upward means to overcome resistance—it is always a victory. To descend or fall is to surrender to the pull from below, and therefore is experienced as passive compliance.” In Leiby’s PRÄGNANZ, “dashed hopes” are up above, and a figure flies out of the frame below, captured in a running jump and clearing the terms of success—stability as represented by the “better safe than sorry” proverb. 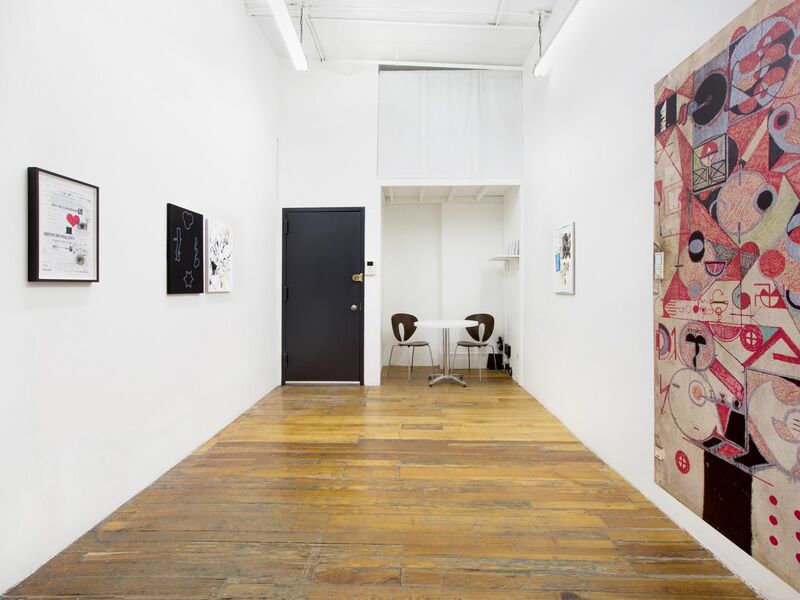 I met with Sofia Leiby in a temporary studio on Bowery, New York, on August 11 2017. H. J. Eyseneck, “A New Measure of ‘Good Taste’ in Visual Art,” Leonardo, Vol. 16, No. 3, 1983, p. 230. 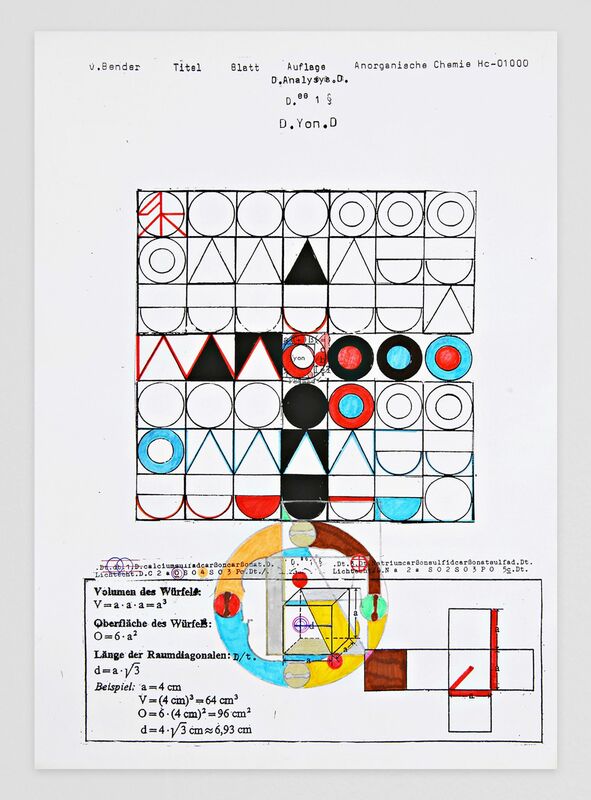 For an argument for the contemporary relevance of Arnheim and Gestalt theory, see Carolyn Christov-Bakargiev, documenta 13, 100 Notes–100 Thoughts, “Nº100: Rudolf Arnheim” (Kassel: Hatje Cantz Verlag, 2012). Rudolf Arnheim, Art and Visual Perception: A Psychology of the Creative Eye (Berkeley, Los Angeles, London: University of California Press, 1974), pp. 11–41.